Islamic radicals support stoning women, terrorism, and killing converts to Christianity. 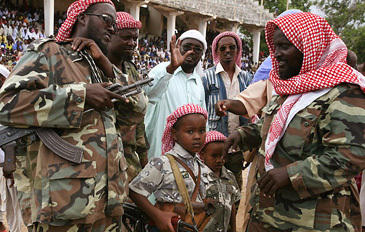 Islamic radicals in Somalia desire to create an Islamic state based on Sharia Islamic law and the brutality of their thinking can be seen by recent events in Somalia. This most notably applies to stoning a young lady to death and beheading a Christian convert from Islam. So will major powers support a policy based on the stabilization of Somalia via economic, political, and military support? Or will the international community do little apart from empty words? If the international community does the latter, then Ethiopia and the African Union will be left to deal with the crisis by themselves despite having major capital concerns. Added to this, radical Islamic forces will allow global jihadists to cause mayhem in neighbouring countries, and much further afield. This should alarm regional nations in Africa and throughout the world because we all know the consequences of global terrorism. Therefore, it is essential from a humanitarian point of view to support Ethiopia and the African Union, alongside moderate forces in Somalia. If this does not happen, then the consequences will be tragic. For liberals and apologists, they will have an excuse for this behaviour or they will deem it to be un-Islamic, however, the reality is simple, conversion from Islam is deemed to be punishable by death in accordance with Islamic Sharia Law. However, the majority of mainly Muslim nations do not apply Islamic Sharia Law to the letter. Therefore, converting from Islam in Indonesia, Malaysia, Uzbekistan, and other nations, is allowed, and non-Muslim minorities have greater freedom in these societies, rather than in nations like Saudi Arabia. So it is important to understand that this codified law is implemented differently and many mainly Muslim nations do not enforce such harsh laws, however, this does not mean that complete freedom exists for non-Muslim minorities. However, in nations which are not centralized and where radical Islam exists, then the situation is even worse. This certainly applies to Afghanistan and Somalia because random justice is applied by Sunni Islamic radicals and by terrorists who desire to rule by fear. So in modern day Afghanistan and Somalia we can see a linkage because of the weakness of centralization in both nations, therefore, failed states are “breeding grounds” for both Sunni Islamic radicals and terrorists. The same applies to parts of Pakistan where Islamists have a strong power base, however, some centralized nations like Saudi Arabia also persecute non-Muslims via draconian laws. Given this, global terrorists in both Afghanistan and Somalia desire to implement draconian laws. Also, internal conservative Sunni Islamic forces have little power to stop global jihadists from spreading their dangerous ideology. So even if elements within Afghanistan and Somalia do not support global terrorism or such a rigid system, they have no power to prevent global Islamists from spreading their hatred and terrorism. This notably applies to the Taliban, because the Taliban did not directly support September 11th, but they were unable to contain Al-Qaeda. So it is apparent that Somalia and Afghanistan are frontline states in stemming the tide of chaos and brutal justice, which is being enforced on people who reside under radical Islam in both nations. If you doubt the harshness of radical Sunni Islam in Somalia, then maybe the next bit of information will wake you up? For example, Mansuur Mohammed, 25, converted from Islam to Christianity in 2005 in Somalia. This individual cared for all Somalians, irrespective if Christian or Muslim, or if you had no faith. Therefore, he worked for the World Food Program (WFP) and he tried his best to help the people of Somalia. Yet to al Shabab, a radical Sunni Islamic organization in Somalia, he was deemed to be an infidel because he had left Islam. Therefore, on Septmeber 23rd, 2008, the al Shabab beheaded Mansuur Mohammed in the village of Manyafulka. Not only did they behead this kind and considerate young convert to Christianity, but they even filmed the beheading in order to threaten other Somalians. To make matters even worse, the beheading was slow and Mansuur Mohammed was tormented by Islamic Sunni radicals, who were glorifying the name of their prophet, until he passed out and died such a brutal death. More recently, a young lady in Somalia was stoned to death for adultery. It was reported that Aisha Ibrahim Duhulow had been raped and then sentenced on the grounds of adultery. Therefore, around 50 men began throwing stones at her head after she had been buried in the ground, so that she could not escape and in order for her fear to be complete. At one point nurses were made to check if she was dead after the stoning began, but when it was confirmed that she was still alive, then radical Sunni Islamists began to throw more stones until she died in complete agony. So if the world wants to stand by and let Ethiopia and the AU deal with this crisis, then shame on all major economic nations for not supporting the stability of Somalia. If we add to the equation both global terrorism and piracy, then it is apparent that from both a humane point of view and from a strategic viewpoint, that stability is required in Somalia. However, this can only happen providing moderate forces in Somalia work alongside the AU, Ethiopia, and other positive forces; however, this needs to be backed by economic, political, and military support, from the international community. Failure to act means that in the long-term you could have a radical Sunni Islamic regime which not only persecutes the people of Somalia, but which also threatens regional nations and which allows Islamists to plot more international terrorist attacks. Therefore, the choice is stark, either the international community provides genuine political and economic support to positive forces within Somalia and regional nations which are helping. Or nations must accept a chaotic and brutal regime which stones women to death and kills all converts who leave Islam. So which way will the international community decide?